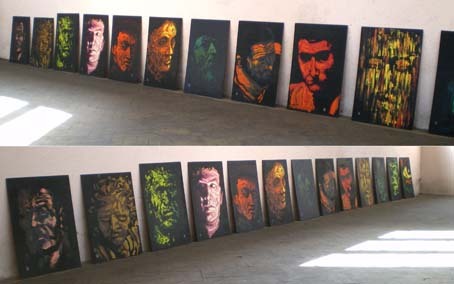 A sequence of paintings in oils using palette knife on textured-side hardboard, primed with blackboard paint, later varnished; no prepatory drawing was involved in the process. This was a reversal of the working method in oil paint usually employed by Borin (working roughs in pencil, smooth white-primed board, underpainting overworked later, perhaps with glazes or scumbling, to produce a 'photographic' finish). Small details from engravings or background figures in Renaissance paintings (Rembrandt, Caravaggio, Corot) were used as inspiration for most of the paintings apart from number 4 which was a self-portrait. Click on a thumbnail to see a larger image. Another rule-breaker: no frames and no wall-hanging for these pictures. This sequence was later on display at the same venue at a Gothic themed masked ball, for which Borin painted four very large wall paintings.